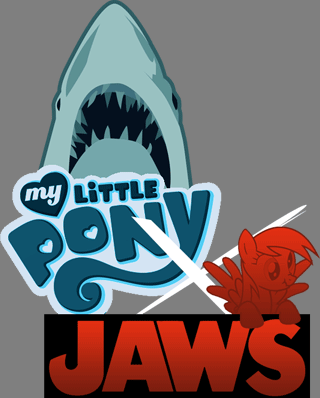 ...Of all the ridiculous fangame ideas that I've ever seen, My Little Pony X Jaws is probably the one that none of us expected to ever be made. From what has been revealed so far about it the game appears to be a tech demo for The Lost Kingdom and will be very strange. For example, it takes place in an alternate ocean-themed universe with the Mane 6 being an elite fishing crew that has set out to kill Jaws after he ate the mayor. If you eventually plan on playing The Lost Kingdom when it comes I would highly recommend that you play this game first, as you can import your savegames from My Little Pony X Jaws to The Lost Kingdom, which will allow you to start at a higher level than you could otherwise. Unfortunately there's no word yet as to when this...interesting fangame will be released, but hopefully it will be soon because I love humorous fangames. Beanseh said that he'll be releasing screenshots of the game soon, so stay tuned for that! A while back I was given the opportunity to try out a tech demo for Minty Fresh Adventure II, and for a holiday surprise Mark was nice enough to release what he called an "Xmas Preview Thing" to the general public. It doesn't show off much except for some new backgrounds and one of the ingame enemies, but hopefully it will make the wait for the final product somewhat easier. It seems Pony Chronicles has come a long way since we first posted on it during Pon-E3 2012. Today marked their second trailer release, showcasing the game so far and some of the beautiful original music. A while ago, a release date was set for late 2012/early 2013, so it hopefully we won't be in for a long wait! 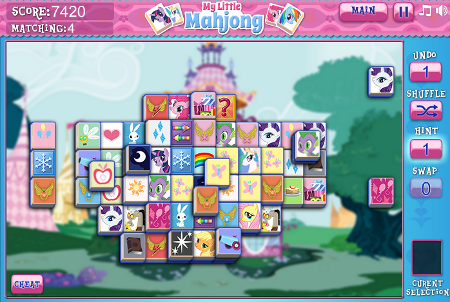 Hubworld has released My Little Mahjong, a ponified version of Mahjong Solitaire. The game itself is pretty simple, and aside from a few technical bugs, quite well done. There are a few different puzzle layouts to try, and you can solve them all to an instrumental version of the Find a Pet song. There's also a shuffle button in case you get stuck. It seems that the developers of PonyCraft have decided to completely rewrite their game in C++, which means that development will probably take much longer than it would have before. To make up for it though they've released a brief update video showcasing Twilight Sparke's new abilities and voice acting by the talented Rina-chan. Not much, but at least it's something, right? Anyhow, you can find the video update below the break. I was originally going to put it at the top of the article but figured that you would like to see the game's fabulous logo in all its glory. 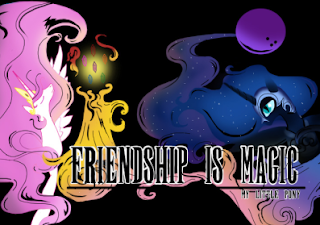 Over the last few weeks, MLP: RPG has gone through substantial updates, including a full graphical facelift, personal housing, and the inclusion full library of songs! Check out the longer v1.88 trailer above, and the v1.93 housing update after the break! It's been quite a while since Equestrian Dreamers last released a My Little Investigations demo, and now that their new one is out what does it have to offer? Nothing story-wise, but there are a bunch of minor tweaks and technical improvements. 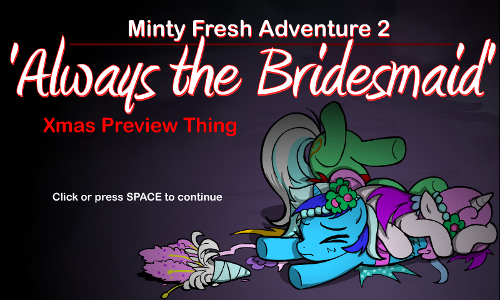 Hopefully the demo will actually work on my machine this time, but in case you want to give it a shot you can download it over at http://www.equestriandreamers.com/downloads/. Enjoy! 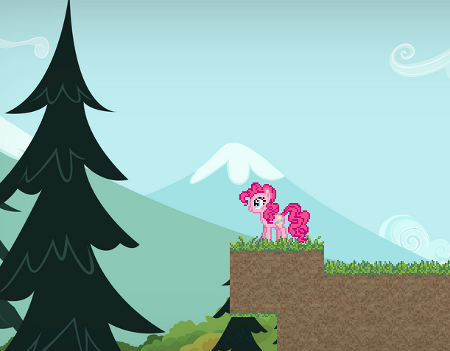 I know what you're thinking: "A Pinkie Pie Platformer? I've played hundreds of those. Give it a rest, already." Well, hold your horses, so to speak. Just recently, Silly Mare Games released Stroll, which strives for an artsy, open-world feel rather than following in the hoofsteps of the rest of the genre. Does it find a successful niche, or is it just a bunch of walking around? You know where to click. Sadly, I'm a little lacking in Warhammer experience. Hopefully, that won't be true for long! AribanDeTyral's written up a lengthy ponified version inspired by the game, and he's looking for critique on his first draft. Find the rules above, break out the blind bags, and play some tabletop ponies! Update 2: the link now points to a game version with some initial feedback implemented. Man, you guys just keep cranking out these RPGs of epic dimensions! With 20-25 hours of advertised gameplay, Nurse Dashie has put together a game I'm not even ashamed to say I haven't finished yet. 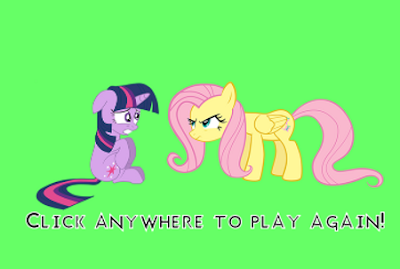 All you fans of pony games which you can really sink some time into: listen up! This might be just your cup of tea. More after the break! A little while ago, I got a chance to commiserate with one of you over the gradual disappearance of Desktop Ponies. 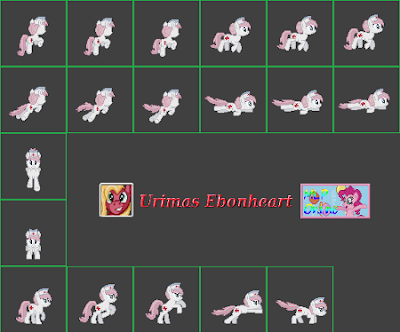 Although I'm saddened that MLP:Online came to such an abrupt end, it's cloud has a silver lining: enough free pony sprites to power an army of fan games. Find them here! 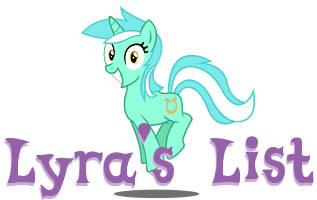 To Urimas, and the rest of the MLP:Online team: thanks for your generosity. You deserve a salute from all of us here at EQG. To the rest of you: what are you waiting for? Get to work! Ok, I know it's tricky to stay angry at Rainbow Dash after this morning's episode - but in the season premiere, she knocked best pony flying in a jousting match. That sort of behavior is inexcusable. Thanks to NutcaseNightmare, creator of Pony Wings, now you can make her pay! Um... if that's alright by you. You could also get knocked repeatedly in the mud. 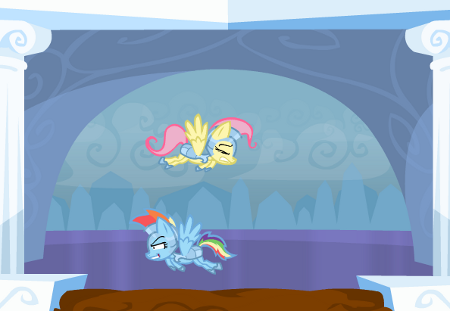 Engage in the sport of pegasi champions in this quick, sleek pony jousting game. 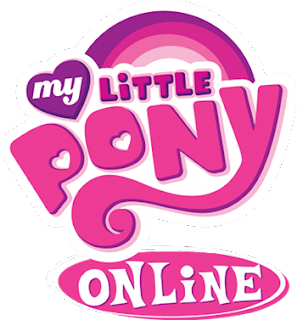 If you have visited MLP:Online's website at all during November you would have noticed that the game was no longer available for download, with an announcement that the game was no longer under development. No details were given as to why this might have been the case, but today our suspicions were confirmed in that the project had been taken down by Hasbro for copyright reasons. All hope is not lost, however, as the developers have stated that they are going to begin work on a new MLP-related fangame, and will give details on how to help fairly soon. Anyhow, in case you want to read the original announcement you can do so via this link or just go down and read beyond the break. Sweet mother of Celestia, that was quite an episode last weekend. In just a few days, it's spawned loads of fan content - including games, of course. Astounded? Don't thank me, thank sparklepeep, FearlessPie, and SylrePony! More after the break. For some reason it seems that nearly all of the of non-Flash My Little Pony fangames are RPGs, and most of which are announced are never heard from again and forgotten. This is probably due to the fact that making a decent RPG takes a lot of time and effort, which often proves to be too much for many developers to handle. A small team calling themselves "Slammin' is Jammin'" have recently announced their upcoming RPG and released a promotional video that shows off some interesting concept art and...less than impressive gameplay (although to be fair the game is still in the pre-alpha stages, so that is to be expected). Will Pony Tactics: Salvation ever be released? I have no idea, but you can find their promo video and some more information on the game after the break. 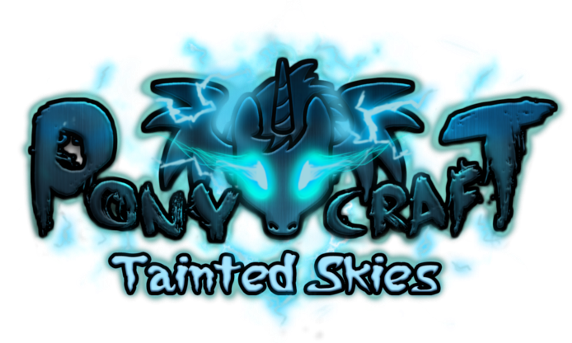 There seems to be a decent portion of the fandom that is addicted to playing Canterlot Siege, and Nitrouspony has decided to feed their addiction with an Android port of the game. Now I don't play Canterlot Siege myself that much, but for those that do (and aren't iOS users, who'll have to wait a bit longer for a port) this must be a godsend. Interested in giving the port a shot? You can download the .apk file over at http://sta.sh/0k8abuu6ijo. Have fun! 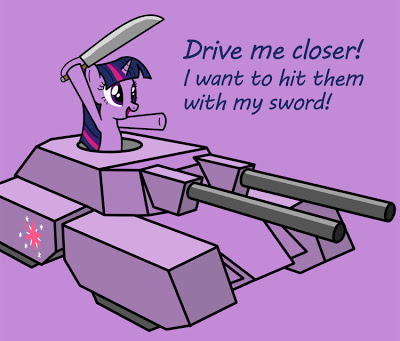 So, I know you guys like Super Smash Bros. Brawl built around ponies - how about ponies inserted into Brawl? Spearheaded by turbobear, this project currently includes several skins for Rainbow Dash (including Scootaloo and WonderBolt) and a variety of moves. While it's far from finished, you can download the current build here. The project is currently in growth mode: the team is looking for an animator, a modeler, and an additional code monkey to finish up Dash and begin work on the rest of the Mane 6. If you're interested, or just want to follow the project, the official thread can be found here. Have fun!